Boy, did Minelli ever fail. The Witch City is alive and well! SALEM -- There's no escaping the witch on these cobblestone streets. There are ancient witches, modern witches, wax witches, stuffed witches. Everywhere, the classic broom-riding sorceress in the pointy hat adorns T-shirts and shot glasses and coffee cups. The hundreds of thousands of tourists expected to descend on the town this Halloween season can visit dozens of museums and shops specializing in the occult, including the Witch Dungeon Museum and the Salem Witch Museum, where exhibits are translated into six languages. Or they can hire practicing witches for a tour of the city's "magical spots." But some city officials think the time has come for the Witch City to play down the history that has linked Salem to the supernatural ever since 19 accused witches were hanged on Gallows Hill in 1692. The city's tourism group has hired a Boston firm to reinvent Salem's image, to emphasize its art, ships, architecture, restaurants, and shopping. "The witch history has always been an important part of the city and always will be, but [Salem] has sort of gotten known very narrowly in terms of the Halloween thing," said Mark Minelli, president of Minelli Inc., the consulting firm hired by the city. Minelli has proposed a new slogan: "Think you know Salem? Think again." The soul-searching over Salem's public image has angered some residents; they say the city should not forsake the witch theme, which helps attract more than 1 million visitors each year. Highlighting the city's arts and culture, they argue, will mean less tourism money. "People come here for witch history," said Leif Rochna, executive director of the Salem Witch Village and the Salem Wax Museum. "We have something that is so unique. It's a huge tourism tool. For many, many, many years, we've been known as the Witch City." The witch permeates Salem's everyday life: At high school football games, the mascot wears a pointy black hat and sits atop a broom. The same image is emblazoned on police cruisers, and the witch rides the masthead of the local newspaper. Others say that the whole witch image has descended into kitsch. They point to the posters that appeared around town this month to advertise the annual Vampires' Masquerade Ball in October, depicting a woman wearing a black bikini, fresh blood smeared across her mouth and body. After protests that the posters were too racy, organizers took them down. Despite Salem's history, witch-related tourism only recently came to the town of about 40,000 residents. When Arthur Miller came to Salem to research his 1953 play "The Crucible," based on the witch trials, he reportedly was astounded that no one in the city wanted to talk about witches, said Jim McAllister, a local historian who runs Derby Square Tours. In 1970, the popular sitcom "Bewitched" boosted Salem's national profile when it aired a string of episodes, filmed on site, which took place in the town. In subsequent years, two other events drew attention to the city's history: The Salem Witch Museum opened, and Laurie Cabot, the city's first self-proclaimed practicing witch, moved to town. "No one in Salem had ever seen a witch before," said Christian Day, a practicing witch. "They read about them in history books." By the 1980s, the city was hosting Haunted Happenings, which will hold its 24th annual Halloween festival next Thursday. In 1992, the 300th anniversary of the witch trials attracted a record number of tourists. Salem has also evolved into a haven for practicing witches around the country. Day estimates that there are at least a few hundred witches in Salem, who meet regularly to call on the spirits. Witches like Day say that, contrary to popular belief, they do not practice evil or worship the devil. Satan, they say, is a product of the Christian tradition and does not appear in witchcraft. Some witches see witchcraft as a religion. Others, like Day, do not. "I see it as a way of life," said Day, a founder of the Festival of the Dead, a host of events celebrating the supernatural, from the $175-a-ticket Official Salem Witches Halloween Ball to the Annual Psychic Fair and Witchcraft Expo. It is a way of life envied by many witches from less witch-friendly places, who wax enthusiastic about recent visits to Salem and dream about moving to town. Those who post on online message boards for Salem frequently describe themselves as "in the broom closet" at home, unable to live openly as witches. "It was like I found the missing piece of the puzzle to my life," wrote a poster who signed her self Goddess and said she cried on the plane ride home. "O well, maybe some day I can get out of Iowa and live in Salem!!" But Salem is changing. The city -- named one of the country's most livable communities earlier this year by a Washington, D.C., nonprofit group -- has seen a housing boom and a host of restaurant openings. The Peabody Essex Museum reopened last year with a $125 million expansion that transformed it from a sleepy local exhibit into an acclaimed collection housed in a complex nearly as large as the Museum of Fine Arts. This summer, a new wireless zone opened downtown. Tomorrow an upscale 86-room hotel is scheduled to open on Pickering Wharf. The city's evolution led Destination Salem, the local tourism office, to decide that the city needed a new advertising campaign. Last summer the group hired Minelli Inc., which helped the museum restyle itself, under its sleek new acronym, the PEM. 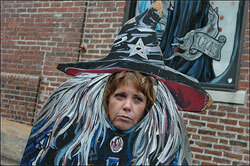 City officials say they are not trying to rid the Witch City of its witches. Instead, they say, they are trying to expand the image of Salem to include its other, year-round attractions and emphasize its storied maritime history. "Salem is a widely known and perhaps even worldwide recognized city," said Mayor Stanley J. Usovicz Jr. "But I think with that recognition, it becomes an almost pigeonholing of what Salem is like, being known as the Witch City. We're much more than that." Minelli argues that while the witch history draws tourists from across the country, it might not lure visitors from Danvers. But they might make the trip, he said, for a good restaurant. Salem also needs to appeal to young people who might buy one of the city's new loft condos, he said. But Day argues that the effort to reshape Salem's image is nothing more than an attempt to cover up the city's supernatural bent. "They want the cash but they don't want the flash," he said. Some opponents of the new campaign fear that it is fueled by people moving into the city who want to stamp out Salem's unique culture. 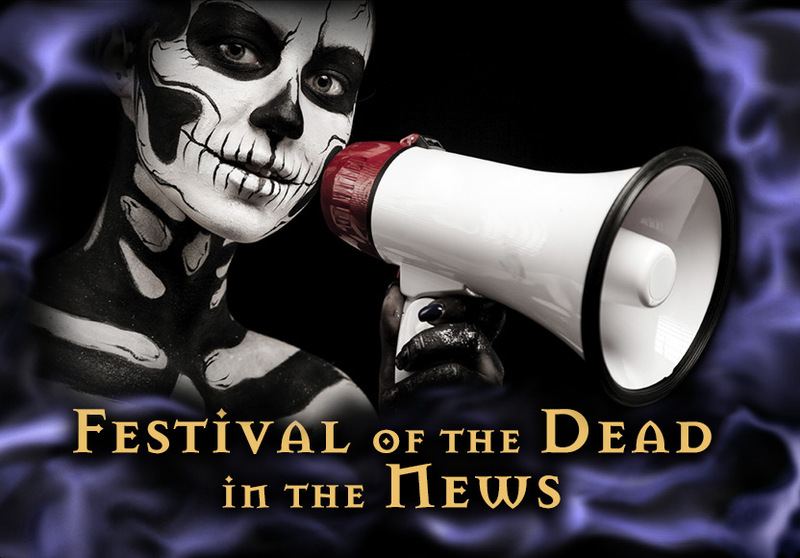 "I think a lot more people are moving out of Boston into Salem," said Bob Murch, another organizer of the Festival of the Dead. "It's become a little yuppie. That's great, but the reason they're moving there is because it's such a unique city. Once they're there, they just want to change it." Murch, who owns one of the largest collections of Ouija boards in the world, learned firsthand the power of the traditional Salem brand. When he first marketed a "talking board" called Cryptique, sales were slow. "It just didn't click with the public," Murch said. "But when we called it a spirit board from Salem, Massachusetts, bing! Our sales just went through the roof."